Rinse millet and allow it to drain completely. In a heavy-bottomed skillet, heat one tablespoon olive oil over moderate heat. Add millet to the pan and, stirring constantly, toast until golden but not brown. Pour in two cups of hot chicken broth and add one teaspoon of salt. Stir and bring the liquid to a boil. Fluff the millet grains with a fork and add Parmesan and herbs. Form into palm-sized patties. In the same skillet, heat another 1 tablespoon of olive oil. 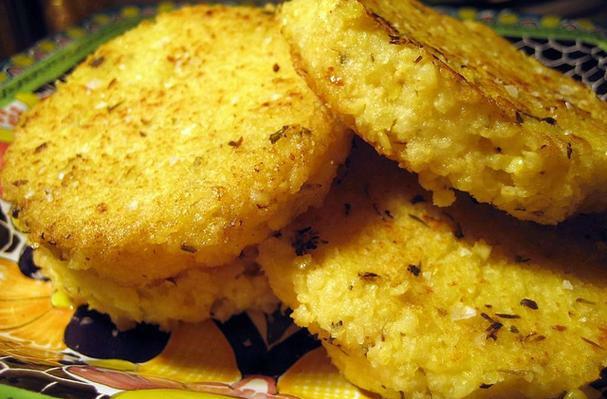 Add millet cakes and fry, over medium-high heat, until both sides are nicely browned. Millet is an excellent source of Magnesium and is great for energy metabolism. Any herb can be used as can any liquid (water, vegetable or beef stock). This is a quick and healthy meal!